Top 7 Scone Making Questions - Answered! Mastering the art of whipping up a fresh, light, crumbly and delicious batch of scones is something that is easier said than done. Getting consistently brilliant results after every bake can feel elusive, but when you're hosting an afternoon tea party at your home, you need to be able to get it right first time. Scones not fluffy enough? Too Dry? Wonky? 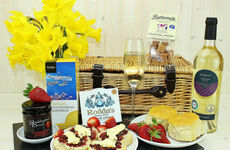 Classic Cornish Hampers will guide you through the most common scone making questions and how to resolve them, right now! #1. How Do I Stop My Cutter From Sticking To The Dough? #2. What Type Of Flour Do I Need? 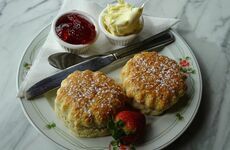 Try self-raising flour - it will improve shape and form of your scone, giving you a light, fluffy feel that no one will be able to resist. #3. How Do I Stop My Scones From Drying Out When Baking? Simply place them close together on the baking tray, they will rise in close proximity and retain moisture more easily. #4. How Do I Get Light & Airy Scones? Double sift the flour and aerate the mixture by lifting the flour from a raised height when kneading-in the butter. #5. How Can I Make My Scones Rise Evenly? When cutting your scones during the preparation phase, you want to make sure your batch rises evenly and are not lopsided. To remedy this, take your cutter - dip it in a little bit of flour as mentioned previously - and press down on the dough and simply push it out. Don't twist the cutter whatever you do! #6. Do I Use An Egg Wash Or Milk Wash? Egg wash can be used for a glistening shine but we recommend using a milk wash which will add a brown hue to pale scones. #7. How Do I Cut My Scones? Once they're baked and ready to be served, break your scones apart using only your fingers. This will ensure that you don't compromise the texture, keeping your scones feeling light, fluffy and authentically crumbly.